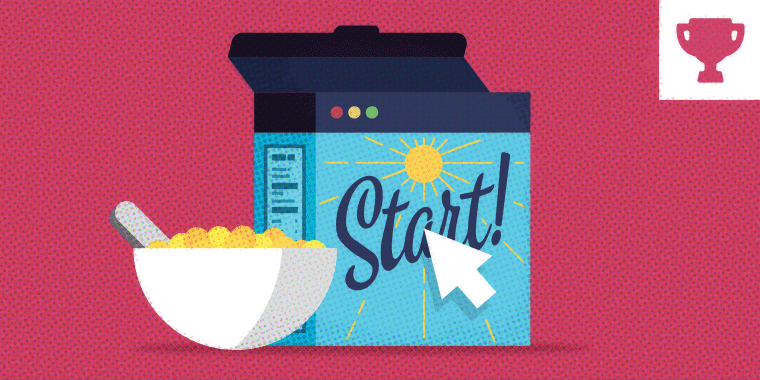 This week, your challenge is to design a cereal box with e-learning as the theme. Fortify your design with healthy superlatives, attention-grabbing bursts, and witty catchphrases. You can create your cereal box in either portrait or landscape mode and can be based on a popular or fictional cereal brand. Your entry can be static or interactive. If you’re going with static, then the Oddest Course Title challenge will be a great place of inspiration. The design techniques used to create cereal boxes are just like those used to design e-learning slides. They both use design elements like backgrounds, title and body text, characters, and related objects. The biggest difference is the orientation. If you’re inspired, try creating portrait and landscape versions of your entry. Remember the joy of seeing the plastic-wrapped toy fall into your cereal bowl? Those cheap toys made breakfast the best meal of the day! 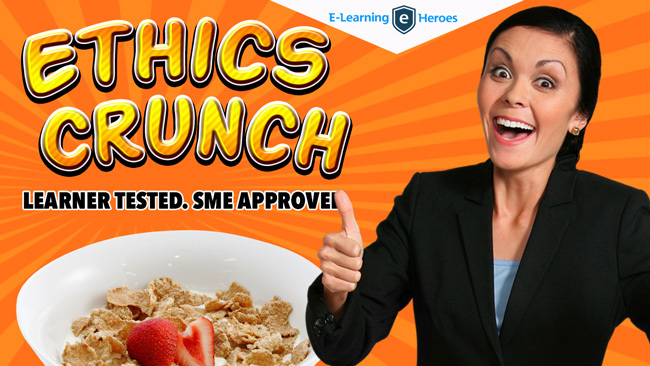 What’s the e-learning equivalent of cereal swag? Try taking a page from Seth Godin’s Free Prize Inside for prize ideas to include in your e-learning makeover. Help learners make healthier e-learning choices by informing them that their course is safe and nutritious. 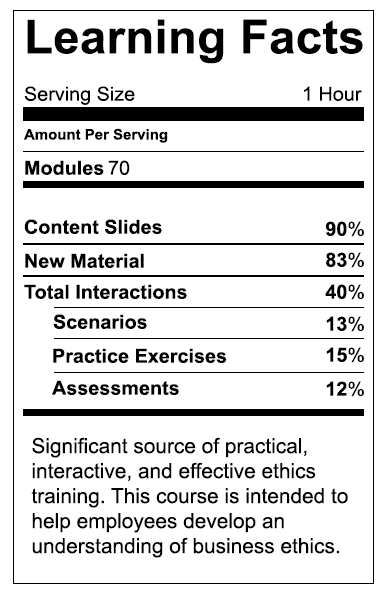 Nutrition labels are a great design element for breaking down the course ingredients or stating the course objectives. Selling breakfast cereal is a competitive industry. You’ll need to turn your graphic gaudiness up a few notches to compete for your learners’ attention. Wishing you a GR-R-REAT! week, E-Learning Heroes! Hi Linda, It's been awhile. I hope to get back in here soon. We'll have to touch base; maybe after the holidays Daniela. Sounds good. I'm ready anytime. OK, so here's my mini-project: http://bit.ly/1MgbQvA Only one click and you can get best e-learning rings for breakfast. Enjoy! Sweet bunches of e-learning O's you're fast, Joanna! Love the elearning superlatives and healthy ribbon effect. Wow Joanna, is that a world record entry? I love the flat kitchen design and pleasant colors. Thanks Alex, but only cereal box is my design. Kitchen background is a stock illustration which I bought. Cool! I love the whole kitchen. That is well done! Reminds me of Fruit Loops. Cute Joanna! I like the "out of the box" line Joanna! This is such a refined piece of work. I tried copying so as to learn but wasn't great at it. https://drive.google.com/file/d/0BwzaQ1Z2BrnZdXdySmdEcWdrTFk/view?usp=sharing Could you guide me to refine the same. Thanks. It's all yours, Mel! Make us proud! Nice, Tracy! Scope Creepies could add a nice jolt to any ID's breakfast. Thanks, Jackie--glad you liked it! Great job Tracy, that's was hilarious, I'm loading up on this cereal once it goes to market! I am going to send this cereal box to some of clients. It is bang on and I love the design. This was great, Tracy... and I'd really love to get one of those "Sir Freelance" action figures! Love it Tracy! Think my favourite part is the Sir Freelance action figure. I want one! Nice beast, Sabrina! Who wouldn't buy that cereal? Really nice job Sabrina. I think I would like to see a way to go back to the start on this one. Maybe you could use the "Will have you running back for more" as a back button. Thank you both! That's a great way to link back to the start Nancy. Nice job Sabrina, we could all use a healthy diet of scenario based e-learning. Nice work Sabrina - really like the intro piece. Thanks Jackie. They are not working right in html5 so may have to reconsider my approach. Are we going to see something from you this week? Miss seeing your work! Well they look great in HTML! Yes - (and thank you) - I fiiiiiiiiiiiinally got a challenge done that I'm about to post. Woo-hoo! Nancy, your face hover states look fabulous--love your cereal box! That's cool, Nancy. I like the social media feature with Tweet option. Nice work Nancy, good idea with the links to examples also! Nice work Nancy. Didn't notice the face hover states at first. Very cool effect. I like your gamification Nancy! lol that is so funny and so true. Is there a correct order? Noooo...everybody gets to fail. :) It's really just a demo of how I feel when viewing those courses. Thank goodness it's not often! That is what I figured. I still see a lot of courses like this unfortunately. Thanks, Dan! We're still trying to engineer more flavor in there - tough to do when all the room for ingredients is taken up by confusion and frustration. Fabulous, Jackie! Very fun... and frustrating! Marshmallow dreams of escape..Brilliant idea, Jackie. So comforting to know that it was ok to err throughout that traffic jam ! Awesome work none-the-less Jackie. What an imagination! Love those loops. And the music is killer. Excellent. I'll be smiling about this one for days on end! Love this one Jackie, glad to have you back! It's great to see you again in the challenges, Jackie! I love the strawberry jail keys and marshmallow dreams of escape! I feel like both elements would be very at home in a Beatles song, for some reason. Hey Alexander! I've tried viewing your link on iPad and desktop. It looks like it's going to the right demo location, but nothing appears on the page. Interesting indeed Jackie, are you using Internet Explore or Edge? I experience the same as I was trying to show the demo to my wife. I could hear the audio but, a big delay on the video. As a backup try Chrome, which has not given me any issues thus far. I welcome any tips to resolve this though. I ran it on Edge and it loaded quickly and ran just fine. I think it has more to do with the speed of the Internet connection. This is crazy Good Alexander. I especially like the game on the back. Very creative, Alex--I love the shopping trip idea, and also the game on the back of the box! I accessed it in Chrome. It did take a while to load. Because of that, I had a feeling that there was a video rather than a static page in the beginning, but I had to reload the page a couple of times before I got the full effect, and the audio. P.S. It's probably my connection. I just noticed that EVERYTHING is loading really slowly for me today. Good, do any of you guys think the load issue might be caused by the compression rate on video? Thank you for the awesome feedback Ashi! It might be the compression - did you use the auto compression or set it to no compression? SCORM chips - I love it, Alex. Nice video view. Great idea Alex. I had no issues viewing it. Love the warning on the side, Alex! 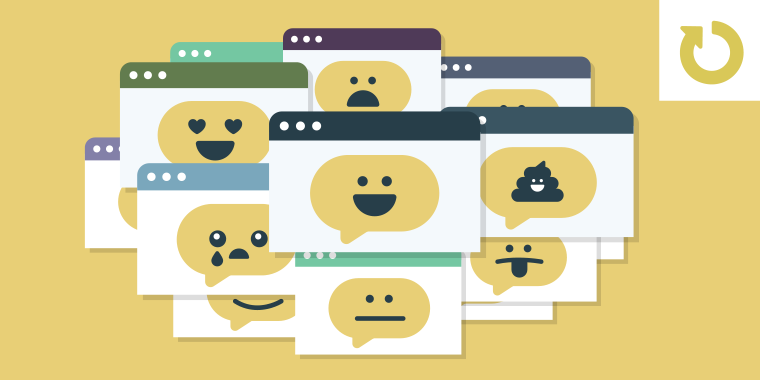 "Consumption may trigger elevated levels of creativity and e-learning awesomeness." So true with great e-learning and with your demos! You have some really awesome demos, Alex! Love the commercial aspect. It brings back memories - Hey Mickey!! He won't eat it he hates everything. I loved it, just like Mikey! Nice, that takes me back Christina. Bullet Blasters!!! Gamify your breakfast by removing the unwanted bullet marshmallow treats. Any chance the mystery interaction figure is an Atsumi character? I think we threw a few Atsumis in there, and a few game show hosts as well. * I really liked it! * I wish that I could require some clients to eat a bowlful every morning. * I probably need to eat a couple of bowlfuls every morning myself. * It's not fair to keep the mystery action figure a mystery! * Cut * It * Out * Tracy! Nice job, Dan! And putting Bert's face... er, hand... on the package will make it fly off the supermarket shelves! I always start my day with Bullet Blasters (paid promotion). About that payment Linda, Bert tells me he's kind of strapped for cash, sorry. Please don't shoot the messenger! I must have only tweeted about Bert's Bullet Blasters and not given him props here. I love it! It doesn't mention the flavor, but I'm guessing it tastes like victory. For some reason I yearn to see him a bit messier with some milk and a maybe a few soggy flakes of cereal around his mouth. It's always good to see a satisfied customer/owner/celebrity spokesperson. I was just going to say that I do this about 50% of the time so had to laugh when I saw David's comment. I think your cereal box is great and love the concept. You're making me hungry, Jane! Love it, Ashi! If we're lucky they'll take that cereal off the market soon. Seems kind of dangerous. Comic sans is very unhealthy, poor Bryan. That's very slick, Ashi! Wow Ashi, he must have been running to bathroom all day. Very funny, Ashi--I love it! No wonder he felt unwell! Hey everyone! I'm loving the examples this week! Please keep 'em coming! I'm in a workshop all week so I won't have as much time to share your examples on Twitter like I usually do. Would one or more of you be willing to help me out this week by: 1) take a screenshot of the example 2) Tweet the example w/ screenshot and link to either this challenge, the user's example, or the user's blog post if they have one? I'll retweet from our accounts to help push the examples but I wont have nearly as much time to follow the updated examples in the challenge. Thanks in advance and I'll check in at the end of each day! Don't forget to add the #elhchallenge to your tweets, I assume you want us to do that David? I'm down with that kind of morning jumpstart! Blair, great minds think alike, my project looks very similar - different topics though! Love it! Haha... I hate when they forget my prize! Nicely done! Great stuff, I really like the "shake the box" animation. Hi all. Loving the entries so far this week. Here's my entry: https://drive.google.com/file/d/0B9hyMDODCcxGZ1BDU1BSalZzLXM/view?usp=sharing I couldn't resist the opportunity for a little wordplay on an existing cereal and a bit of a dig at a certain type of eLearning. Good idea, really nice graphics. As someone who has been reviewing a lot of Compliance training courses for the last two weeks, I feel the pain of all the checkboxes, Shaun. So many boxes O.o. There is good Compliance training out there, but it's few and far between the boxes. Great design! Great job Jamie! Serious question cause I am new to this like you. How did you get it to be portrait vs. landscape? I'm trying everything but can't figure it out. Hi Charles! To go from landscape to portrait in Storyline just click on the Design menu at the top. On the far left of the ribbon you'll see "Story Size". The simplest thing to do is uncheck "lock aspect ratio" and manually key in (swap) the height and width numbers. Great example Jamie. Welcome to the challenges. Hi-LAR-ious Charles! I don't think you'll be up to your neck in hot water as much as you will be with orders for boxes of cereal. I assume that gleam in his eye is his future vision of a world with nothing but awesome e-learning. I love this Charles, very funny! That's brilliant, Charles! Can I order full box of these please?? I recognized the reference right away, Charles. Veeeeery funny! I love the prize. Great job. Great use of video! Immediately transported back to Saturday morning cartoons! !